The Spiritual Motherhood Society is a group of women authorized by the Archdiocese of Baltimore, who are dedicated to praying for our priests, as well as for an increase in vocations to the priesthood. The Blessed Mother is the epitome of maternal love to whom every disciple was entrusted by Christ as she stood at the foot of the Cross. 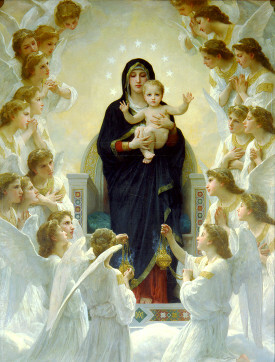 All priests are entrusted to Mary, the Mother of the High and Eternal Priest. It is her example spiritual mothers follow. Through prayer, sacrifice, and Eucharistic Adoration, spiritual mothers support and sustain our priests. Regardless of age or marital status, all women can become spiritual mothers for priests. The characteristics of a spiritual mother include a commitment to prayer, and anonymous relationship with a priest through that prayer, and an openness to meet with other women in the group in order to pray as a community. A spiritual mother offers herself to God, praying and becoming a point through which an abundance of God’s grace might flow to bless the priest and sanctify his work! For more information, see our Facebook Page. If you would like to join a Spiritual Motherhood group, contact Tricia Baynes at baynes4@verizon.net.